Blogger has certainly been testing us this week! It has been quite hard visiting everyone's challenge entries and leaving comments as Blogger seems to be erroring all the time! I really hope I haven't missed anyone. If I have, I'm really sorry. Hopefully the problems will be sorted soon! This week's challenge at Winter Wonderland is 'Santa Claus Is Coming To Town'. Ooohhee i likes this, and the ribbon is sooo lush! So lovely this is :D Just adore the paper you used ! 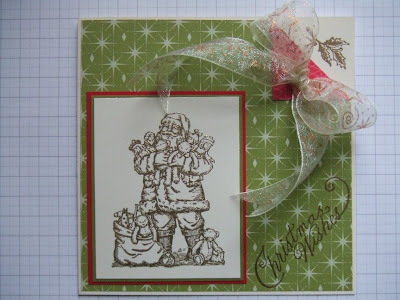 Teri wow what a great christmas card, I love how you folded the corner and stamped there...That looks great and very creative...awesome Santa and beautiful paper and ribbon treatment!! !